The Safari is a new concept in inflatable design. Self-bailing, definite rocker, slight keel, compact size and low profile combine to provide a sophisticated and technical paddling experience on whitewater, ocean surf, placid rivers and lakes. When firmly inflated the Safari side tubes and self-bailing floor create a rigid, integrated hull that delivers surfing and turn carving performance comparable to hard-shell kayaks. Thighstraps, which are standard equipment, provide precise control and allow Eskimo rolling as well. Weighing a scant 24 lbs., Safari packs small in its own drybag/backpack for compact travel and storage. For touring it comes with removable tracking fin. Made of Nitrylon. Nitrylon is a lamination of nitrile synthetic rubber and natural rubber over a 1,200-denier, low stretch polyester fabric. Nitrylon is very puncture and abrasion resistant. It is considerably stronger, easier to patch, performs better in cold weather, and is much more abrasion resistant than PVC. It also does not have the environmental problems associated with the manufacture and ultimate disposal of PVC products. Available in color red only. The Swing uses an efficient "tubeless" system. The hulls are made of rip-stop polyester fabric, rubber-coated on the interior for air-retention, and Teflon®-treated on the outside for water repellency and stain resistance. The air-holding seams are vulcanized and permanently bonded (similar to the way in which tires are vulcanized). Each chamber is individually tested at the factory for air retention. The Swing "tubeless" construction parallels what tire manufacturers went to decades ago - it is inherently light, but it also inflates to a higher pressure than competing bladder kayaks (3-psi vs 2-psi). The higher pressure means that the Swings are stiffer in rough water and have snappier paddling performance. Other decked inflatable kayaks are built using an unreinforced vinyl bladder inside a zip-on skin. This technique results in a heavier boat... and the potential for water to get trapped making it difficult to dry and pack away. Swing decks are urethane-coated with zippered access for gear storage and cleaning ease. The decks shed water quickly and easily. The deck support system uses aluminum arches fore and aft of the cockpit openings. These arches are set crosswise and provide a deck shape and structure. The arches contribute to the stiffness of the Swing for paddling in rough water. These arches can be removed easily for a compact folded package, or left in the kayak for a slightly larger folded size. The Swing has carrying handles on each ends. An optional spray skirt is available for the Swing cockpits. Polyvinyl Chloride (PVC) is increasingly being recognized as a material of significant environmental concern. The Swing is free of PVC. 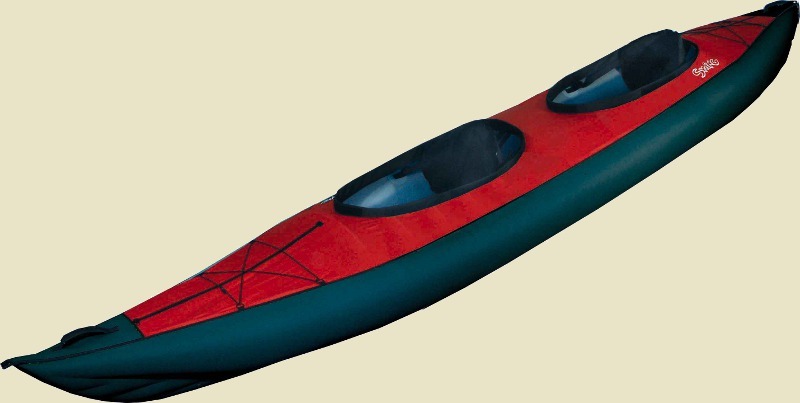 Each kayak is divided into three separate air chambers for safety. The valves are sophisticated "bayonet" style units set flush with the fabric surface. A pressure relief valve is installed in the kayak floor chamber to relieve possible overpressure. Setup time with a manual pump is about 5 minutes. MATERIAL: LitePack hull treated with Teflon® water repellent - No PVC! Available in red/black color only. Other decked inflatable kayaks are built using an unreinforced vinyl bladder inside a zip-on skin. This technique results in a heavier boat...and the potential for water to get trapped making it difficult to dry and pack away. RECOMMENDED ACCESSORIES: paddle, UV Protector, PFD, spray skirt. Innova Swing II Tandem Kayak. 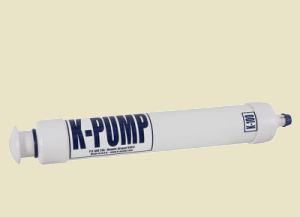 The K-Pump model K100 inflation pump offers approximately 20% faster inflation times than the Bravo 1 foot bellows pump. The K100 is a simple, easily maintained, and durable design. You can also more easily use this pump to add air to boat chambers while paddling out on the water than you can a foot pump, and it does not need a connection hose. •Weight: 2 lbs. - 3 oz.